An endless passion for exploring sounds and rhythms. Jimmy is a Montreal based blues guitarist with a unique and original blend of styles. Self-taught, his music reflects many influences, but never copies. No stock blues licks, no learning how to play a song the way it sounds on the record. His guitarwork is inventive and innovative, based on his own very different way of seeing music. The reason we love to watch him is because he is constantly stretching, experimenting and expanding. You will never see him play a song the same way twice, and so he is always exciting to watch. With fingers that move at incredible speeds and a dexterity that seems at odds with his calm and easygoing presence – he’s a guitar player that other guitar players love to watch. That passion for discovering new things about music grows stronger every day. Born in a remote village in Greece, Jimmy grew up in Montreal, and discovered his passion for the guitar at age 13. From that moment on he devoted himself fulltime to learning how to play. He has spent tens of thousands of hours practicing, jamming and gigging. In his own words, he’s been playing on the Montreal blues scene since before it was even a scene. He is deeply respected on Montreal’s music scene, not only for his unique and original style, but also as an excellent collaborator. In more than 40 years of playing professionally, he’s played with just about everyone; from Nanette Workman to Pagliaro to Karen Young. He’s a mainstay in the Quebec music scene with regular gigs with his band at local clubs, and appearances at festivals such as the Montreal Jazz Festival and the Mont-Tremblant Blues Festival. 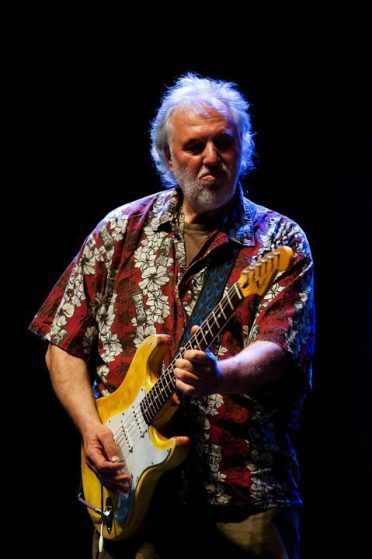 Jimmy has jammed with the likes of Jeff Healey, Frank Marino, King Crimson and Vanilla Fudge as well as opened shows for Stevie Ray Vaughan, Lonnie Mack, David Bowie, David Lindley, and Steve Vai. Working with Michel Pagliaro on his album Coup de Coeur, Jimmy co-wrote many of the album’s songs as well as played guitar on all of them. Nanette Workman is another famous Quebec singer with whom Jimmy has collaborated with closely, and whose albums bear Jimmy’s name as guitar player. Other collaborations involved musicians Karen Young, Breen Leboeuf, John McGale, Angel Forrest, Carl Tremblay, Jim Zeller, and more. Jimmy’s television exposure includes guest spots on Norman Braithwaite’s popular Quebec television show, Beau et Chaud among others, and two television documentaries on his musical career: one for Le Point and one for Bravo Blues.